So much for Donald Trump changing his tone to something more presidential. 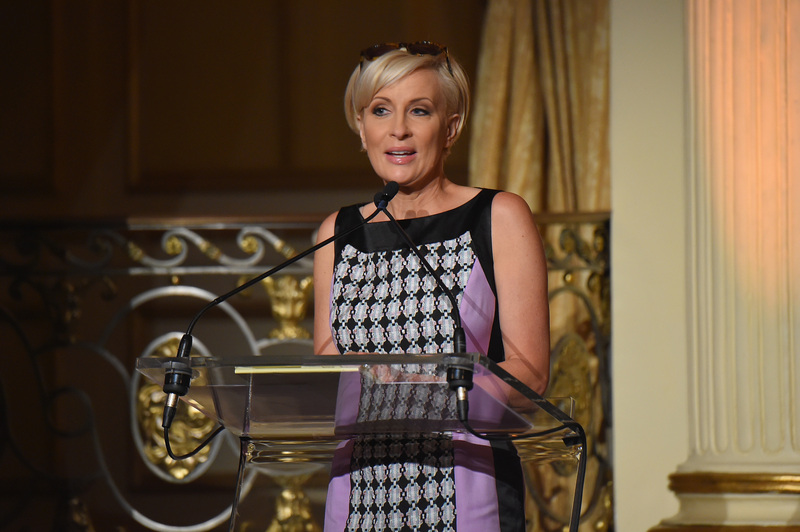 On Monday morning, Trump unleashed incredibly sexist tweets about Mika Brzezinski, co-host of MSNBC's Morning Joe. The GOP candidate has blatantly displayed his sexism over, and over, and over during the 2016 presidential campaign; however, Trump's tweets about Brzezinski show he's still got plenty of steam when it comes to lobbing unfounded attacks against women. After Brzezinski and Morning Joe co-host Joe Scarborough criticized Trump during a Monday morning episode, Trump tweeted that the show is "unwatchable" and that Brzezinski is "off the wall, a neurotic and not very bright mess!" Yup, a man who could very well be the next President of the United States tweeted that. But wait, Trump didn't stop there. Instead, just a few minutes later, Trump tweeted again about Brzezinski, calling her Scarborough's "very insecure long-time girlfriend." Calling women "neurotic" is an age-old insult — women have historically been stereotyped as "hysterical" and, really, by 2016, they should no longer have to deal with having their mental state called into question just because of their gender. Trump's sexism is no secret, but it's still shocking to see someone outwardly use such sexist and gendered language when referring to a woman (it's 2016 for goodness' sake) — especially someone who wants to be the next President of the United States. Of course, this is not the first time Trump has called a woman in power neurotic, or some variation of it. Nope. In November 2015, Salon reported that Trump called then-DNC Chair Debbie Wasserman Schultz "crazy," and went on to refer to her as a "highly neurotic woman," during an appearance on a Breitbart News radio show. Trump's "not very bright" jab at Brzezinski is also an ugly, sexist echo of his calling Fox News Megyn Kelly a "bimbo" last year, when he didn't like a question she asked him during a debate — a question about his treatment of women. Apparently, Trump's go-to move when women publicly question or criticize him is to simply imply they're dumb. It wasn't enough for Trump to slam Brzezinski as "neurotic." It's time to unpack the rest of Trump's tweets about her. In his second Monday morning tweet, Trump claimed that Brzezinski is Scarborough's girlfriend. What's worse — and even less presidential — than promoting rumors is that Trump called Brzezinski "very insecure." Using the word "insecure" to insult a woman, and, therefore, call her confidence into question, feels almost as outdated as using the term "neurotic." And let's be honest, Brzezinski is not in the slightest bit lacking in confidence when she critiques Trump on Morning Joe. It's 2016, not 1950, and the Twitterverse made it clear that rather than shining some miraculous new light on Brzezinski's mental state, intelligence, relationship status, or confidence, Trump's Monday morning rant did little more than reflect poorly on the GOP candidate himself. Scarborough responded to Trump later on Monday tweeting, "Neurotic and not very bright? Look in the mirror." Now that sounds about right. Unfortunately for Brzezinski, she's become one in a long line of women subjected to Trump's sexism; however, each time the GOP candidate attacks a woman in such a sexist manner, he exposes his own backwardness for the whole country to witness before it heads to vote on Nov. 8.